Kaliyatam is considered as an ancient socio-religious ceremony of North Malabar as every village has its own identified divine places called ‘Sthanas’. The word Kaliyatam originated from the word ‘kali’; means ‘sefety’ and it had a great importance in ancient times because it is performed for the safety of society and the family. Kali worship was common in certain part of North Kerala especially in the reign of ancient kingdom of ‘Kolathiri’ (Chirakkal Raja). During the course of time apart from kali worship people started to adore the heroes and heroines of the past as performing their embodiment image as ‘Kolams’. Kolam in malayalam means the shape or forms of God and Goddess. They have their own peculiar and specific forms and each form has its own mythological background. Usually the kaliyatam lasts for three to eleven days. Along with Gods, Goddesses were also exists and usually called as ‘Bhagavathis’. To bring out each aspects kolam has special features in face painting which is a work of difficult craftsmanship and is a unique piece of art. 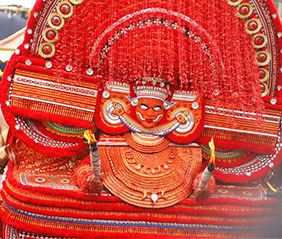 Theyyam is essentially a human creation. It has absolute relationship with man in giving vent to his strong feelings against injustice and wickedness and his desire to maintain the well being of the society. It shows how the primitive mantras form his life experience in to metaphysical thoughts through rites and rituals and identifies his abstract visions in a concrete design, attributing multiple forms to them. These rituals are also responsible as being believed for the blessings of the super nature for prosperity in man and women, cattle and wealth. It is also done as an offering for begetting children, winning of Law suits, warding of evils, getting rid of epidemics and for similar successful culmination of individual and social desires.